When it comes to the Hunger Games, no one is dying to be one of the tributes. If you’re going to volunteer as anything, your safest bet is to live the life of luxury as a Capitol Citizen. While the rest of Panem is struggling to eat, sleep and essentially stay alive, the citizens of the Capitol are overindulging every chance they can get. I mean, there most anticipated form of entertainment is watching the children from the Districts fight to the death and then partaking in all the celebrations the Hunger Games allow them. They even eat until they can’t anymore because they have a handy little elixir that allows them to throw up and go back to enjoying the party once more. If faced with a choice between fighting to the death and eating and drinking your days away while looking good doing it, what would you choose? In honor of Mockingjay Part 2 premiering this month, we made up one of our coworkers to become the most glamorous guy around. 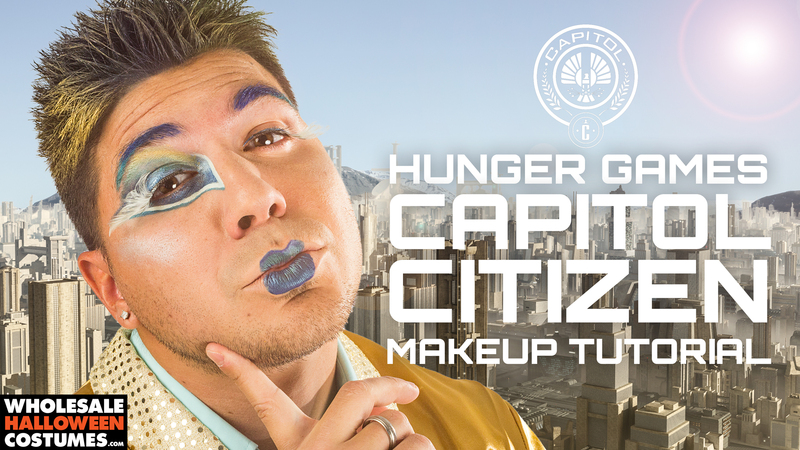 Taking notes from Caesar Flickerman’s impeccable style, we made sure our Capitol Citizen felt fierce and fabulous. We chose to go with peacock-like color theme. Start by spraying color hairspray with 1-3 colors that will coordinate with your final look. Use foundation to even out your skin tone. Apply foundation over the corners of the mouth. Use two colors and paint over the eyebrows to make them ombré. Stick with the same colors to create pouty a ombré lip. With similar colors paint on glamorous eye makeup. Freehand the design or find an image to use as reference. Line the other eye with a dark color from the design. Apply lash glue to feather lashes and apply to each eye. Add a sweep of pearlescent makeup over the tops of the cheekbones as a highlighter to finish the look. Dressing up for movie premieres is the latest craze, so if you’re heading to see the conclusion of the Hunger Games series as either a tribute or a Capitol Citizen, don’t forget to share it with us on Facebook, Twitter or Instagram!